Although there are a number of known black holes in the universe, it is exceptionally rare to see one drag a star into its hungry maw. Van Velzen explains that the star must be ‘very very unlucky’ to succumb to such a fate. For the first time ever, scientists have witnessed a supermassive black hole swallow a star and then eject flares of matter moving nearly at the speed of light. A research team from John Hopkins University recently published their findings in Science. The paper explains how, though long theorized, such an event has never before been seen. “It’s the first time we see everything from the stellar destruction followed by the launch of a conical outflow, also called a jet, and we watched it unfold over several months,” said Sjoert van Velzen, of John Hopkins University. It has long been known that the gravitational pull of a supermassive black hole is so strong that not even light can escape from it. Yet to witness a black hole consume a star was truly remarkable. The victim was a star roughly the size of our sun. As the star drew close to the black hole, the pressure of the force inflicted on it was so great that the star was ripped apart into “spaghetti streams of gas” according to van Velzen. The black hole was able to draw the star towards it using the exact same mechanism that the moon uses to draw the oceans’ waters towards it. Except that while the Earth has enough weight and gravity of its own to resist the moon’s pull, no star is strong enough to withstand a supermassive black hole. 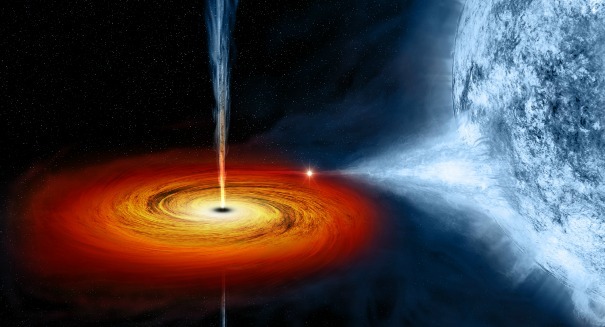 Indeed, scientists theorize that the gravity of a black hole is even strong enough to warp time. “From our observations, we learn the streams of stellar debris can organize and make a jet rather quickly, which is valuable input for constructing a complete theory of these events,” van Velzen said.